"Failure will get you further than fear," that's what Lara Casey told a room full of women last May. Hopeful as I sat on the edge of my seat looking to glean the spark God has set ablaze in her. Failure will get you further than fear. I teetered on the boundary line of my comfort zone and acting in obedience. And there she was, this petite, darling red-head speaking what He'd been telling me for weeks: "if He's called you it, then do it." We can come to Him just as we are. No need to tidy up all those messy parts of our lives before approaching the throne. His love welcomes us broken, His hands ready to cover us with grace and send us out with hope. A few years ago I walked into a storm that would break me in the most beautiful way. By accepting a new job I found myself tossed into the tides of a legal battle that would teach me the greatest lesson of my life: He orchestrates beauty from brokenness. Month after month we forged forward using our gifts to pursue justice in the storm. Yet, day in and out more people were pulled into the wake of this storm with no light in sight. My heart clung to the justice system with a steadfast faith until one day it broke into a million little pieces. Right there in my little office I fell to my knees sobbing, looking to the Lord with empty hands, heart surrendered to His will. In our brokenness, He is able to work good. From the depths of our brokenness, He writes a story of grace. In that place the we've declared a 'bad season', His Gospel is the Truth that declares us victorious. Let it break you. When we see the world through the lens of the Gospel it will break you. Going through the motions doesn't please Him, but when we come to Him with the broken pieces of our heart, He's able to begin the good work in our lives. He delivers us from our fears, and gives us opportunity to walk in His ways. It doesn't have to be flawless, it just has to be done, humbly. Let's bring ourselves to the Cross broken, allowing Him to mend us and send us out to build for His Kingdom. At our best, in our brokenness, His love never fails. I want my brokenness to sink into Jesus' presence and not just rest there but be propelled outward to share this Gospel love with others. 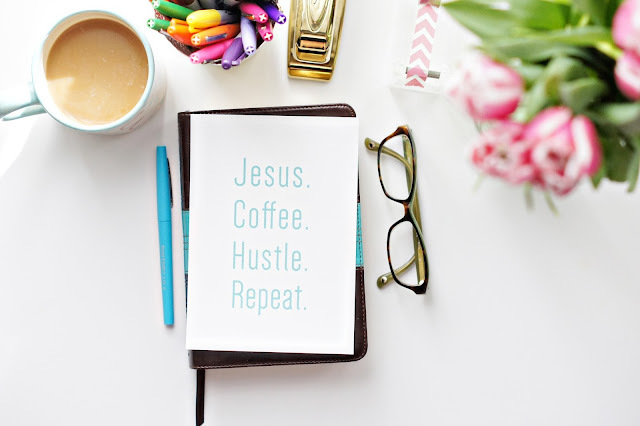 All the coffee and hustle will never fully fill me if I'm not seeking Jesus first. Because of the Gospel we can hustle and not grow weary. His loves allows us to hold ourselves to a standard of grace not perfection. Loosen the reigns bit by bit until you've fully surrendered them to Him. It's okay to be broken. Let His word speak truth over you, friend. Heart-shattered lives are best prepared for His will to be done. I want to breath in the meaningful of the seemingly mundane moments of the daily routine. I want to look to the Cross and know that because He lives I can walk free and full of joy. I want to delight in His ways and draw near to Him. I have this awful habit of starting a book then never finishing it. I'm committing myself to reading (and finishing) at least four books this year. This number may be small to some, but I want to ensure I squeeze every ounce of grace & gumption out of each book on the list! First up? 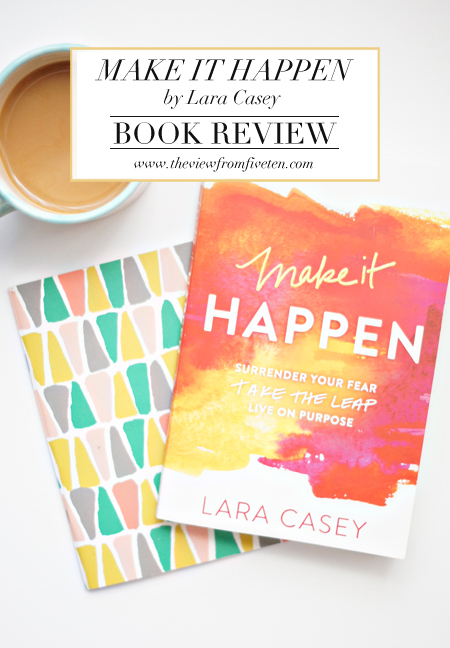 Lara Casey's Make it Happen book - find my book review and top takeaways here! I've loved sharing my becoming a blogger series with you love the last few months, but when real life causes you to throw the editorial calendar out the window and choose present over perfect you just go with it. I served up grace for the blogger. Grab yourself some here. My favorite link to love this week: 3 Questions to Help you Define Success via Chatting at the Sky. Here's a little teaser: When my soul feels overwhelmed I can almost always trace it back to my trying to define success in terms of an outcome I can’t control. NOW? Now I'm off wrap up the hustle of the work week and prepare my heart for a social media free weekend hopefully filled with belly laughs, date nights and curling up with this quarter's book! This year, I've added to my goals: read more. I want to really make the margin meaningful. Where contentment and joy meet, that's where I want to steady my heart. I need to silence the distractions stealing my margin to truly savor the goodness of the daily routine. So, I'll be replacing a smidge of social media time for diving into a handful of books. Through books I can nourish myself in a lasting way. First-hand memoirs of adventure, faith, refinement and the joy in the journey. To cultivate a life of joy I need balance between the heart and the hustle where I find a slow rythym to the daily routine. It'll take purpose on my part, but will no doubt be worth the efforts. I hope to make it through at least two books a quarter in 2015. This seems like a small number to some, but I want to ensure I take the time to squeeze every ounce of grace from each book on this year's list. When Lara Casey announced her book, Make it Happen, would be shipping out pre-orders January 1, I knew this would be the ideal way to start the year. And, oh my goodness friend, it really really was! Amidst the growing pains of finding my way as a blogger, I stumbled upon Lara Casey's blog. Her mission to encourage others is evidenced by heart on her sleeve at all times. Each post published is sweet as honeysuckle yet simultaneously sparks fire in your heart to make what matters to you happen. Lara serves up grace and gumption to pull you out of the comfort zone and into a place where purposeful living can happen right where you are. Though I've read Lara's blog, attended one of her events and a handful of webinar's, I was humbled by the personal way she shares her story in the book. You may as well be gathered around Lara's table for a glass of sweet tea prepared for an afternoon tending to Gracie's Garden. That's how this book brings you in. Delving deep into Lara's heart for knowing your story, planting good seeds, tending to the garden and cultivating a life of surrender. You walk alongside Lara as she lays it all down in surrender for His glory and her good. Lara breaks down all personal boundaries to let us in through career and marriage trials, family tragedy, therapy sessions and a big ole leap of faith to launch Southern Weddings. Through struggles we see refinement and Lara shares how she built on those seasons to cultivate a life of purpose over perfect. Broken down by sections the books weaves your heart in and out of reading and reflection. Be prepared with a pen and potentially an extra notebook. This isn't just a book for reading, this is a book that'll encourage you to get messy in the margins. And really? You can't dive into this book without being compelled to jot down all that's being stirred in your spirit. Live on purpose. It's a challenge Lara presents to the readers. Make 'it' happen. Lara is quick to credit God for making all things possible. It's her trust in His sovereign hand that carries her out of the comfort zones to live a life of purpose. And friend, that's just what she wants for me and you. Step by step you can make it happen in your life and Lara shows you how. The book breaks down your big dreams, life goals and biggest fears into small actionable steps to make what matters to you happen. What I love most about this book, and Lara herself, is that it's sincere. It's a life that's been lived messy and full of hope. She shares these words to encourage our hearts to live on purpose because she's been there and she'll tell you she's still sorting it all out herself. She's surrendered the fear. Taken the leap. Living on purpose. If God is calling you to something greater, He will equip you in His way and timing. There are lots of ways to get busy and then be totally burned out. But there is only one path to purpose: Jesus. logical and possible. Pray hard about the impossible. Our purpose cannot depend on someone else's yes. The only yes that matters is God's. This is the first book I've had no trouble powering through in years. It was sheer joy to read this book. my perfect book is just yet, but Make It Happen has set the bar high. with the book's action steps. Grab yourself a set before she's sold out for the year! If we were to sit down for coffee today, I'd be simply grateful. I see the bright glory of the Gospel as we teeter on the cusp of Easter. I couldn't escape the reminder of Easter weekend if I wanted to. Thankfully, Easter is my favorite. I spend the weeks before Easter reflecting on the ministry Jesus lived out in the weeks leading up to that pivotal moment at Calvary. It's a revival for my spirit every year as I walk through these passages. If Christ died for me, for my sin, then what? Who am I not to turn my hands and heart open to Him in surrender? Expectant as I entered into Lent, the eyes of my heart were opened to new direction. His direction. I found myself somehow just slightly wandering from His path and forging my own once again. Don't we all? Yet, this Lenten season's takeaway has been consistent: drop all things, all of them, and follow Him. No questions. No contingencies. Just follow. Jesus lived His life in obedient ministry. The mundane moments made holy through our Father. His every step was made in surrender. His every action one of a servant. The end of Lent is really just the beginning. My chains, your chains, they've all been broken. Because Jesus came with a servant heart, faithful to the Father, we can walk out with servant hearts for His continued glory. Where are you today, friend? Slowing down with a cup of coffee, perhaps. Stealing a few minutes before the Gospel, I hope.